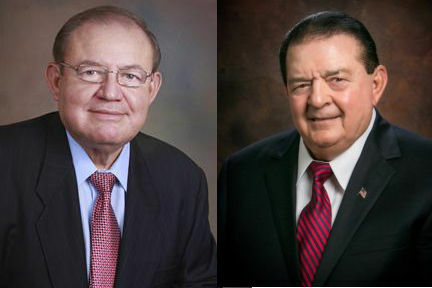 MISSION — County leaders responded Tuesday to Mission Mayor Norberto “Beto” Salinas’ call for a vote on the construction of a new county courthouse in an ad that ran in Sunday’s edition of The Monitor. In his ad, Salinas argued that voters should have a say on whether the county should move forward with the project which is estimated to cost approximately $150 million. “I feel that it is incumbent upon you to make the decision to go ahead and place this issue on the ballot now so the taxpayers can agree or disagree whether or not to proceed,” Salinas stated in the ad addressing County Judge Ramon Garcia and the county commissioners. Salinas said he had hoped the commissioners would have explained to the community why a new courthouse is necessary. Commissioner Joe M. Flores said he understood that if the project didn’t lead to an increase in taxes, it need not be put up for a vote. Salinas argued that even if the tax rate remained at .59 cents, county residents would still end up paying for it through property taxes. However, Garcia, the county judge, explained property valuations are determined by the appraisal district which is supervised and overseen by the Texas Comptroller’s office. Garcia said the county worked to bring costs down by negotiating with the architect to lower the initial estimate. He also said a contract with the construction manager would use the Construction Manager at Risk delivery method, which includes a commitment from the construction manager to complete the project within a guaranteed maximum price. Instead of paying for the project through the more common method of a general obligation bond, which requires voter approval, the county is paying with a certificate of obligation bond. Certificates of obligation are used when projects need to be financed quickly and can be attractive when a local government wishes to, for example, take quick advantage of lower interest rates, according to the state comptroller’s office. They do not require voter approval unless 5 percent of qualified voters within the county’s jurisdiction petition for an election. That is equal to almost 17,000 people, according to figures from last year’s general election.